This entry was posted in WoW and tagged bindpad, clique, UI. Bookmark the permalink. Bindpad looks interesting. How is its functionality different than assigning keybinds to various buttons within dominos/bartender (since you can hide bars in domino/bartender anyway)? Well, don't I feel stupid. I had no idea that dominos had a keybinding function. I'll try it out tonight and see if Bindpad offers anything extra. Dominos and Bartender have a similar interface for this. 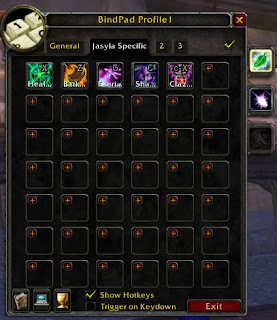 Simply enter keybindng mode (for your specific toon or you can bind keys for ALL your toons – DO NOT RECOMMEND). Then you hover over the key you want and PRESTO. I can see Bindpad being useful if you run out of Dominos space, like if you're a druid and have to use all your bars on paging for forms. After looking at the Dominos keybinding function, there really isn't any difference. With Bindpad, the abilities don't need to be on a bar in order to be bound, but as you said, you can hide bars with Dominos anyway, so it doesn't really matter. I guess that's one mod I can get rid of. The real purpose of Bindpad is as a extended macro panel. YOu only get 36 general and 18 character specific macros in the default interface; Bindpad provides approximately a jillion more. 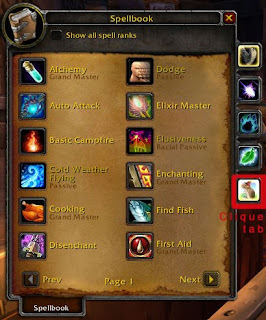 Blizz macros can be put on an action bar, but not keybound. Bindpand macros can be keybound but not put on an action bar. Fair warning about Bindpad: sometimes, it just stops listening to bound keys. 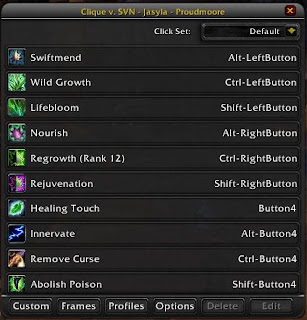 I can't narrow down what causes it, but once it decides to ignore a macro, you'll never get it back short of copying that ability or macro to another Bindpad slot. This odd, unpredictable and untraceable behaviour caused me to stop using it recently. Thanks for the clarification Louis. I haven't been using Bindpad for long so I wasn't aware of all its uses.